A white label version of this just sold on eBay for £261. The miscellaneous #'s after the main matrices are simply 'stamper' numbers. It is doubtful if the A-2U and B-2 are complete but probably these extra numbers (at 9 o'clock and 3 o'clock) have not been noticed).. The Utopia lyre symbol almost certainly will be there on the 1st pressings. The miscellaneous #'s after the main matrices are simply 'stamper' numbers. It is doubtful if the A-2U and B-2 are complete but probably these extra numbers (at 9 o'clock and 3 o'clock have not been noticed).. The Utopia lyre symbol almost certainly will be there on the 1st pressings. However we do have a variant whereby the Utopia lyre symbol has 'R DOWNS' hand scratched over it. This came with the paper sleeve variant. why hasnt this been released in the states yet? 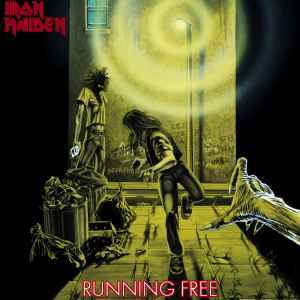 all of the other singles have been coming out in order but since this was the first maiden single then it should have came out with the first batch. it is out in uk. why not usa? anyone know? I once owned a copy of this 7" which had 'Demo record. Not for sale' (wording may have varied slightly) stamped on the centre of the label, but came in a standard (card) picture sleeve and bore the same cat # as the standard first pressing.